In the midst of cleaning, packing, and finishing up the school year, I wanted to share this super-not healthy-but-totally-delicious recipe we made last night. A couple of weeks ago we flew up to D.C. for a weekend of apartment hunting and stopped for dinner at Murphy's Irish Pub. These were on the menu. I died. So delicious. It's like eating crunchy loaded potatoes. They were calling my name last night. 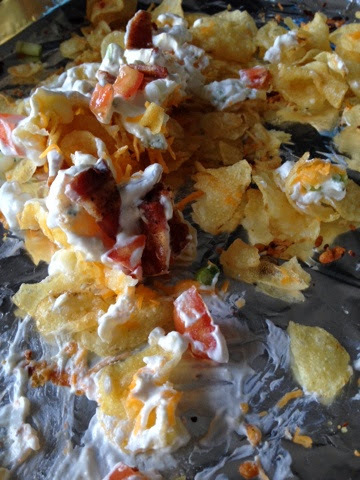 Pile up some kettle chips on a baking sheet lined with foil. Add shredded cheese and finely chopped jalapeños. Add chopped green onion, sour cream, diced tomatoes and crispy bacon. Don't even think about how not healthy this is and enjoy it!